Once you have received a referral letter from your doctor or dentist please call Mr Watson’s secretarial staff to arrange an appointment. 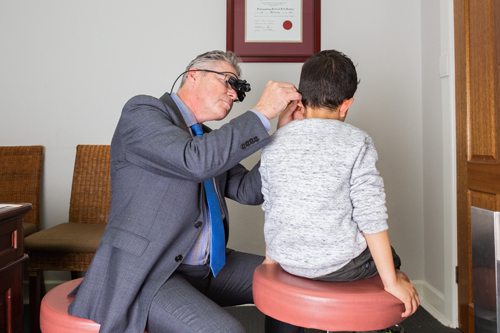 Mr Watson’s staff will ask at the time of booking whether it is an Ear, Nose or Throat problem so that an appropriate appointment can be made. Urgent referrals are to me made via your referring doctor. You will receive a SMS reminder leading up to your appointment. Please provide 24 hours notice if an appointment needs to be cancelled. 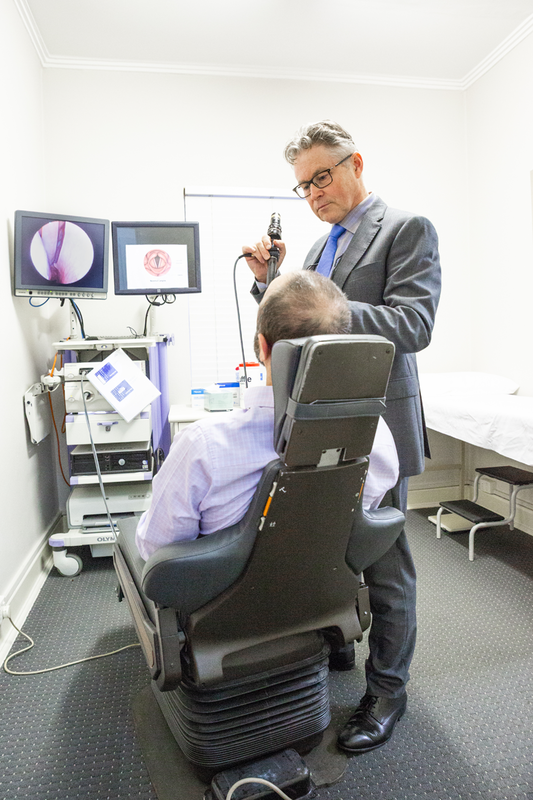 Please bring any relevant test results such as CT or MRI scans to your appointment if you have them. Mr Watson will generally be able to access and view your scans online. A referral from a doctor or dentist is valid for twelve months (unless otherwise specified) and a referral from a specialist is valid for three months. This referral and a valid Medicare card are required in order to receive a Medicare rebate. You will be advised of the consultation fee and Medicare rebate at the time of booking your appointment. In order to obtain a pensioner discount you must bring a valid Aged / Disability / Carers pension card with you on the day of your appointment. Our clinic is a private clinic and payment is required on the day of your appointment. We do not bulk bill. On the day of the consultation please bring your current referral letter, Medicare card, Pension card (if applicable) as well as any relevant results, including physical copies or a disc of relevant CT scans. When you arrive you will be asked to complete a patient registration form. 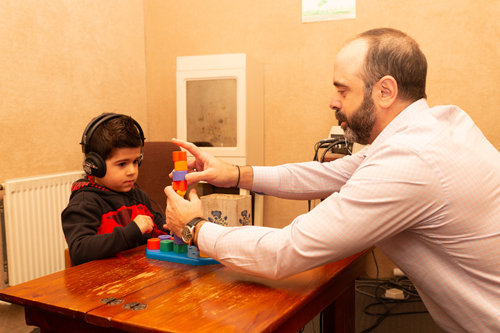 If you are attending for a hearing problem then a hearing test will be conducted by one of our audiologists. 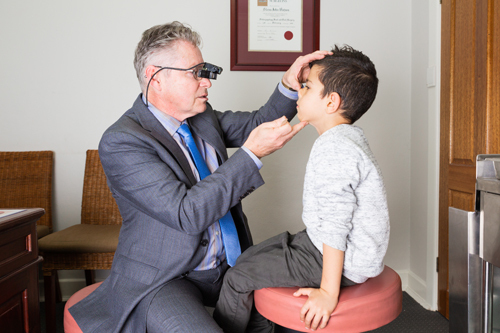 If you are attending in regard to dizziness and/or imbalance, you may also be seen by one of our audiologists for balance investigations. Please allow yourself two hours to have all of the testing completed if you have a dizzy problem. When you meet with Mr Watson he will discuss your concerns and examine you. 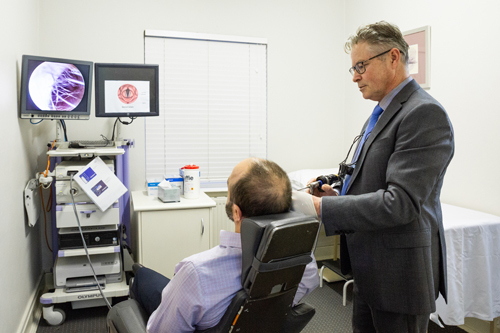 This may include a microscope to examine your ears or a nasoenodscopy to view your nose, pharynx and larynx. A diagnosis and treatment plan will be discussed with you and you will be advised whether any further testing, appointments or a procedure is recommended. If Mr Watson suggests you would benefit from an operation, he will discuss in detail the procedure and in particular the procedural risks. Mr Watson will direct you to his website for further information regarding the procedure. Following this you will be directed to Mr Watson’s secretarial staff who will provide you with a pack which contains an informed financial consent, your anaesthetist’s details and a hospital admission booklet. You will be instructed to contact your health fund to ensure that your procedure is covered. You will be contacted a day prior to your operation to advise you of your admission time and fasting instructions. A post-operative appointment will be made following your operation. If you do not have private coverage Mr Watson can refer you to the public system. Waiting times for the public system will be discussed. You will be advised at the end of your consultation whether a follow up appointment is recommended. If so, Mr Watson’s secretarial staff will arrange this for you. If a test has been requested, you will be advised whether you should return to discuss the results or whether Mr Watson will call you with your results. At the completion of your consultation Mr Watson will dictate a letter to your doctor. Mr Watson will do this in front of you using it also as a summary of the consultation. Please ask any questions you like at this time or of course at any time during the consultation.